Does the water have to be warm?? Doesn’t specify? I don’t normally use my pizza oven for this dough. What type of flour did you use? I usually use Caputo 00 for my black stone oven which reaches similar temps that you describe. How long did you bake? Also, for shorter bakes I find that reballing my dough works wonders for crispness. Also for my Neopolitan doughs I usually use a different formulation (00 flour, water (60% or so), salt (2.5 %), and yeast (0.5%))- mix well til windowpane and then let rise for 8 to 12 hours from temp and **reball ** about 2 hours before use. Can this dough be frozen if I make a double batch? It’s a pain to plan this for everytime we want pizza so I was wondering if I freeze it after the 72 hr ferment, will it still be usable? If so, do i need it to proof again or will allowing it to come to room temp be fine? for those with tempermental ovens, allow the stone to reheat properly between pizzas so that the crust gets properly browned. Comparing your volume measurements to weight measurements, I believe that there are discrepancies. If you use King Arthur AP or Bread flour they are both about 120 gr per cup (see their weight chart: https://www.kingarthurflour.com/learn/ingredient-weight-chart.html. So, 6 cups of flour would be 720 gr.not 796 gr as per the recipe. Could you please clarify whether I should try this recipe with the weight that you have listed or should I go with the measurements? Thanks for the clarification. Can I then safely make this dough using gram weights listed? The reason that I wanted to try this dough out was, that it looked like real New York pizza. My wife, like you, is an Italian from Philly, but moved to New York in her 20s, and I am a Canadian that used to go to there on business. We now live in South Florida and cannot find thin, oily, New York-style pizza that was available on almost every street corner. Some pizzerias advertise New York pizza, BUT IT ISN’T! I will certainly give this recipe a try…..and hope for the best. 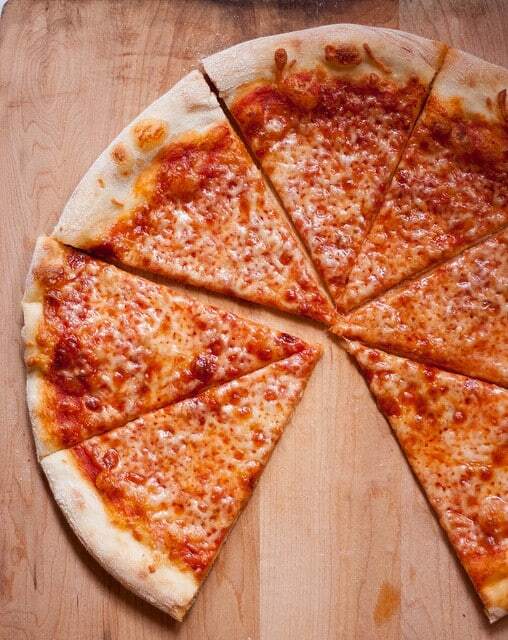 The success of this pizza will also depend upon the cheese used. I have been making homemade pizza for many years, trying different crusts. This is it! I started the dough 3 days ago and made pizza today, my first attempt at this recipe. It was Perfect, very flavorful, crispy crust but still a bit chewy, great texture, no problem eating by hand. 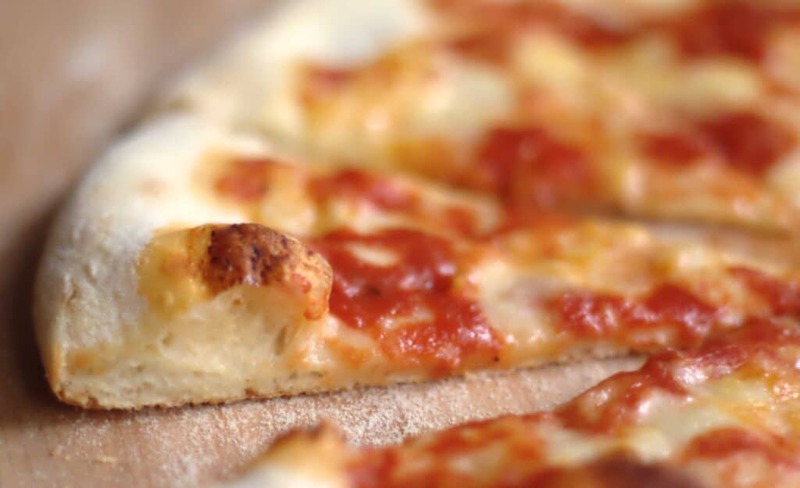 Better than any pizza chain, and better than any crust I’ve ever made. Can’t wait to start trying different flavors with this recipe! Thanks for sharing the knowledge, and the love! Thanks for your great advise can’t wait to try this . I’m a cook by trade (or was anyway, for 20 years), and I’ve been making pizza for decades, both at home and at work. I’ve been searching for the perfect pizza dough, and I’m pretty darn sure this is it. I live in Chicago, and have never had a Pizza in New York, and I’m not taking sides in the great NY vs Chi pizza debate. But the combination of crispy outside and slightly chewy interior of this crust makes it a winner in my recipe book. I shall search no further! I’ve been using this recipe, and sometimes the Joe comes out crispy in chewy which I like, but sometimes it comes out just chewy with no crisp. 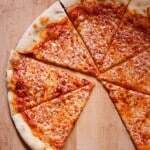 I’m taking care not to use too much sauce or toppings what am I doing wrong in the dough recipe, what can I do to change the texture to a more crispy texture? Appreciate any advice! thank you! It could be a few different things so it’s hard to say. Is it cooked long enough to get that crisp? If yes, try mixing your dough a little longer or even reballing your dough after 24 hours to add crisp. THE BEST DOUGH I HAVE MADE! thankyou so much, i wouldn’t cook it on the aluminum foil or wax paper would i? I would slid it onto the pizza stone before cooking? Looking forward to trying this recipe! What’s the speed & mixing time of using a mixer? Also do you use a paddle or dough hook? I’m trying to make a crispy/bubbly crust…any tips? I’ve been using your recipe for the last 2 years and each time the pizza is absolutely delicious. Thank you for sharing this! This week I used type 00 flour and I didn’t have to modify anything with the recipe, just substituted all purpose flour with type 00. It made 4 dough balls, though they were a little on the small side. I made 2 pizzas and used the other two for garlic knots. Roll it out like a pizza, then cut into strips with a pizza cutter, tie each strip into a knot & bake on a sheet for 4-6 minutes. When they’re done, brush on garlic butter & sprinkle with parmesan cheese. It’s a great starter that can be baking while putting the first pizza together. The kids were begging for more! What temp should water be? I use room temp water or water that is on the cooler side. Can I half this recipe down the middle or will I have to adjust something to make it work? Love this Recipe! has anyone tried to double it and freeze it? It freezes well. 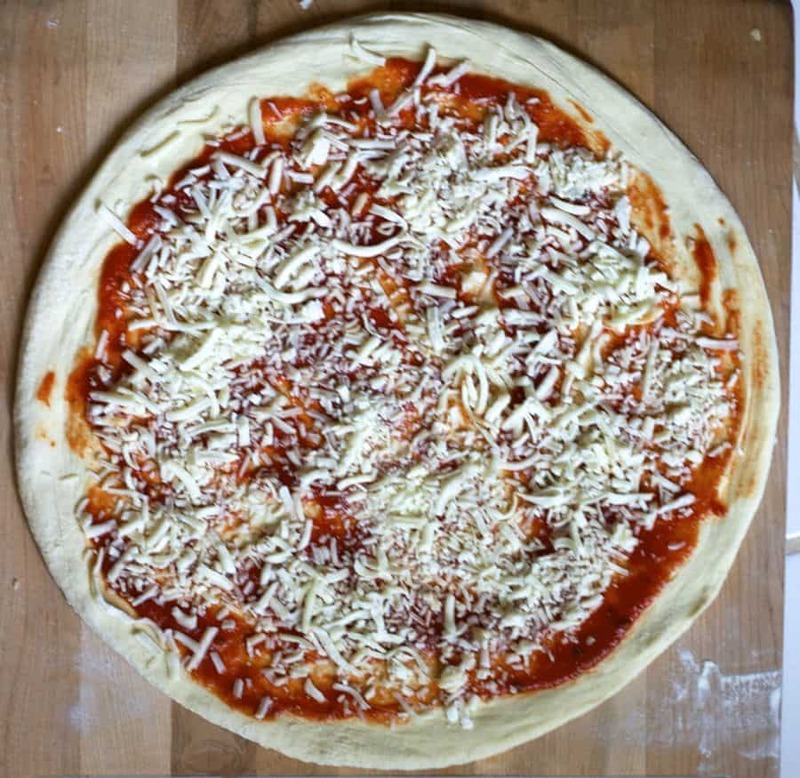 Make sure to divide the dough into single pizza portions and place in freezer bag. I usually transfer to fridge the morning I plan to bake. I assume that you freeze it after it rises? Good recipe. I tried it twice and had mixed results. The first time the dough rose whole in the fridge a little bit (not too much, but enough that it was noticeable), but the second time the dough rose a lot more and completely filled out my quart sized container! Trying to figure out where the difference between both times was… Either way the dough was very good and makes fantastic pizza. I mixed up a half of a batch last night and baked it for lunch today in two cast iron 12″ skillets. It was just as great as delivery and better than some delivery. I have mixed up 1.5 batches tonight to let sit in the fridge for the next 3 days for our Friday night dinner. It is going to save a lot so we don’t order in while we will be just as excited for a yummy treat on Friday. I do not have a kitchen scale so I ended up using a shipping scale which worked perfectly fine to weigh the flour and dough balls at the end. I am confused over the Water 2 1/4 cups seem less than 493g of ml. 493 g of water seemed like a lot of water for 6 cups of flour. Also 2 1/4 cups of water seemed kind of dry. Had to add some . I used a scale except for the water. I used less than 2 1/2 cups. Came out good. In the frige now, cant wait to try it. Thank you. Do you sift your flour first? You left out what to do with the dough balls. Cautioned not to degas dough balls, but went straight to sauce. No rolling pin earlier in recipe. I’m sure we’re talking about rolling by hand. Looks like a very good recipe. TY for the tips, will ck them out. Just bought some Caputo “00” flour. Curious if you have any input on it. I use 00 Caputo a lot! But I use it in my Neopolitan style dough and bake in my pizza oven at 900 degrees. I haven’t tried it yet for NY style. Have been meaning to do a comparison but never got around to it. I like to make Detroit style, NY style, and Neapolitan pizzas and mix it up.. Thanks for these tips. My pizza dough is decent, but always looking to improve it. The tip of using less yeast is what I tried yesterday. Definitely made a difference, I will continue to use this great tip. Last year I upgraded to a baking steel for my home oven pizza baking. It is an improvement over a basic stone. I highly recommend a baking steel. Also, I prefer to make a pizza/pasta sauce(rustic, slightly thick and chunky) I love the can of whole San Marzano(basil leaf) tomatoes. I serve it on the side in a bowl. I bake my pizzas dry, no sauce on them. Just a personal preference.